The latter end of 2014, it turns out, has delivered a fine crop of vocal powerhouses (tune in tomorrow for Sulfur City.) 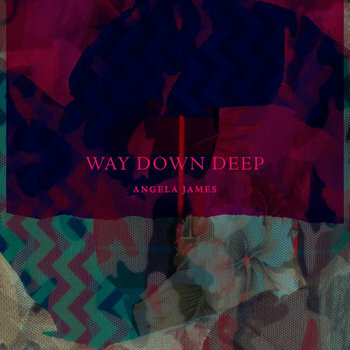 If you found Faith Evans Ruch too twangy for your taste, I guarantee you'll fall in love with Angela James. Actually, if you're a breathing human you'll probably fall in love with her. Way Down Deep, James's third album, was recorded live with some of Chicago's premier jazz musicians. Although this album is Americana to its core, this decision leads to an album that's clean and austere even as it washes you in the comfort of folk music. This is not an album to cozy up to. You have to take a deep breath and jump in head first. The feel of the music would be enough to make the album stand out on its own, but add James's voice into the mix and you get a classic. Brimming with emotion, James is never melodramatic. The tension between her passion and the music's restraint elevates these songs to a keener emotional plane. When August, James's PR rep and purveyor of many of the fine music you've heard here, e-mailed me he promised it would go on my Top 10 of 2014 list. The man knows what he's talking about. Wonderful. Something about Angela James reminds me of Hem -- the gorgeous voice, the languid pace, the unique arrangements, the soaring melodies. Might have to visit her site and buy that CD -- Dave O (todaystunage.blogspot.com).